Raylene Partridge with Meals on Wheels Coordinator Meredyth Rae. For the last three months or so the ladies of the Wednesday Craft Group have been planning, sewing and assembling magnetic fridge shopping lists. Fifty five have been completed and will accompany the meals for each recipient of Meals on Wheels. 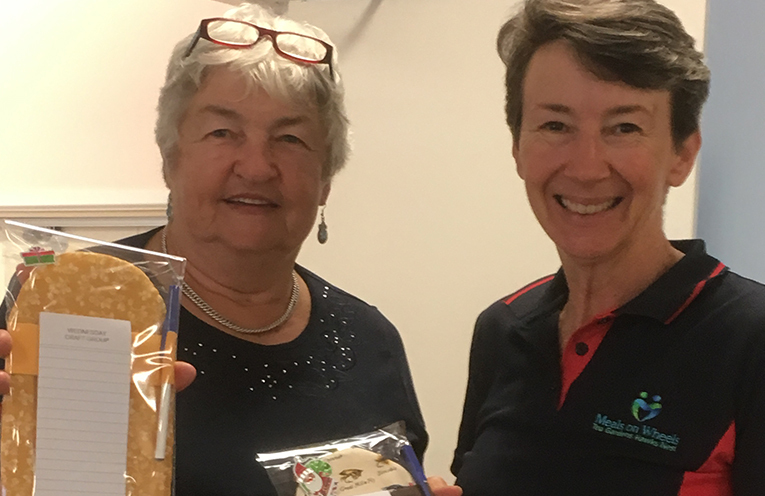 To this end our President Raylene Partridge presented these Christmas gifts to Meals on Wheels Coordinator Meredyth Rae who will play Santa. Each year much thought goes into the suitability and practicality of the gift and once that is sorted it’s full steam ahead, just like Santa’s workshop, well sort of. It give us much pleasure in giving and hope it’s also a pleasure and surprise in receiving.